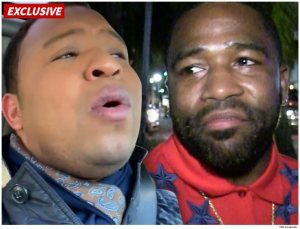 TMZ SPORTS -- Adrien Broner has been ordered to stay away from social media star Andrew C. Caldwell after making a video implying he would shoot Caldwell in the face if he made a pass at him. Caldwell filed a request for a temporary restraining order against the boxer Thursday morning in St. Louis -- which was granted by a judge. Broner must stay at least 500 feet from Caldwell. As we previously reported, Broner threatened to "punch the testosterone" out of Caldwell earlier this week -- claiming Andrew had been contacting him online in an attempt to hook up. Caldwell has said Broner was the initiator. Broner denied that -- and posted a "P.S.A." video online in which he threatened to shoot ANY gay person in the face who tried to make a pass at him ... saying he's aggressively homophobic. Caldwell took the video as a personal threat -- and in court docs obtained by TMZ Sports, he wrote, "[Broner] says on social media that he coming to St. Louis to kill me." The judge felt Caldwell had a reasonable fear and granted the temporary order -- which also requires both Broner and Caldwell from posting bad things about each other on social media. A hearing on the matter is set for April 1 -- where a judge will decide if the restraining order should be extended. Mabilis pa sa "Alas Quatro"
TAYLOR: I AM READY TO RIP THE TITLE FROM BARANCHYK!